From left: Kara Brooks, JM Craven, and Cliff Ashbrook play video games at Roxy’s Central & A4cade. Where to Roxy’s Central & A4cade, a hybrid grilled cheese shop, game room, and bar. This emporium of wholesome fun is a collaboration between Roxy’s restaurateur James DiSabatino and Area Four’s Michael Krupp. What for Board games, booze, burgers, and grilled cheese. It’s a gluttonous mullet: Enter at Roxy’s for counter-service grilled cheese and tater tots; linger at stools or a table with Cambridge families introducing their toddlers to poutine. Or proceed through swinging doors into a holding pen-slash-storage area. You’ll step through what looks like a walk-in fridge — just call it a speak-cheesy — to present your ID to a host, who’ll outfit you with a paper bracelet. 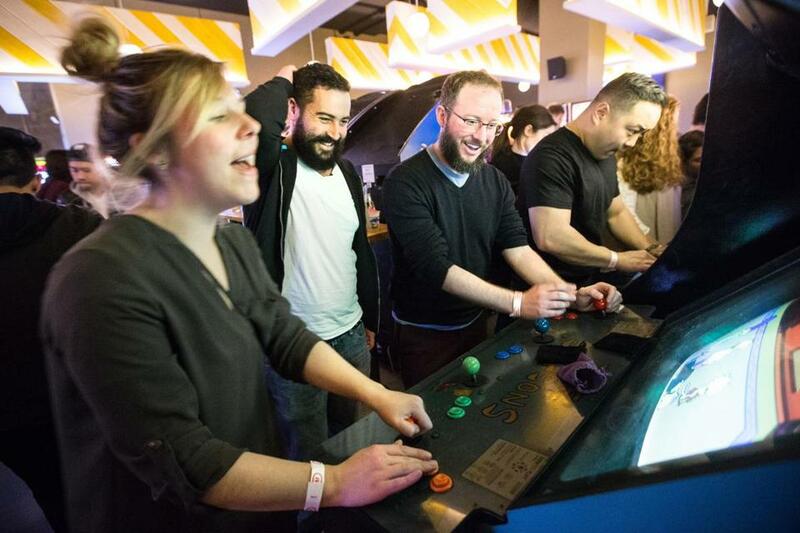 Once you’re in, it’s a free-for-all: Play skeeball and vintage arcade games like “Ms. Pac-Man,” ogle the longest shuffleboard table in the city, and order up some drinks. But prepare for a wait: Everyone had the same idea as you. What you’re eating Meals designed for young metabolisms. Roxy’s is known for its husky grilled cheese sandwiches, and these are here in profusion, loaded with short ribs, bacon, guacamole, and more. There are also hot dogs, coated in smoked gouda sauce or topped with sliced pickles, and bacon cheeseburgers. A “fried potatoes” menu section offers truffle, cheese, and loaded fries, plus a beefy poutine, also available in tot form. For dessert, vanilla soft-serve. Care for a drink? Enter A4cade for playful tipples like rum-and-coconut brain-freezer The Kill Screen and There’s No Crying in Skeeball, a tequila-based concoction that’s “spicy AF,” per the menu. A “Gettin’ Tiki With It” section promises tropical temptations like a Land Shark with cognac and passion fruit; Schwing, Schwing is a “foxy mixture” made with rye and plums. Or you could always order a magnum (P.I., heh-heh!) of wine. Overheard Testosterone-fueled excitement; praise for poultry. A fellow with a fluffy man-bun punches his pal in the shoulder. “I’m gonna get my ‘Mortal Kombat’ on, man!” he says. A trio of young gents, one of whom wears a long navy lab coat, discuss the economics of arcades. “If you’re gonna open one of these places, the games had better be cheap,” says one. A man with a “Star Wars” long-sleeved T-shirt rhapsodizes about fried chicken. “Last time I was here, I ordered two! But I think you need to be drunk to do that,” he concludes.